If you’re looking for unusual things to see in Malaga you usually need to get off the beaten track and take yourself away from the well-trodden tourist haunts. In this post we recommend a visit to Calle Andrés Pérez where a treasure trove of unusual sights await you. We love this hidden corner of Malaga because it offers an insight in the old city and gives you the chance to take in several unusual things to see in Malaga within a very small radius. Plus there are some great shops to browse and several excellent places to eat. This long narrow street that runs between Plaza de los Mártires and Carretería is now 1 of Malaga’s up-and-coming areas. But if you’d walked along Calle Andrés Pérez just a few years ago you’d probably have taken a mental note never to visit again. But an antique business (Casa del Cardenal – see Best shops below) that set up shop in 2011 and a big refurb by the council since then have brought the street back to its former glory. The area’s oldest residents claim that Calle Andrés Pérez used to be home to over 70 shops and business, and that it was such a busy thoroughfare that locals knew it as “Larios la chica” (the small Calle Larios) and “Larios la estrecha” (the narrow Calle Larios). There aren’t quite as many shops nowadays, but this is a buzzy street once again and one that’s definitely worth checking out when you’re on holiday in Malaga. How to find this square – take the first right in Calle Andrés Pérez (opposite Casa del Cardenal) and the square is round the corner on your left. 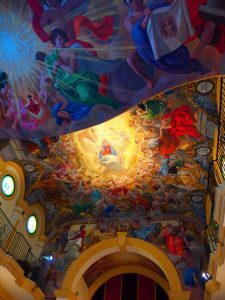 Churches – there are lots of lovely churches in Malaga but it just so happens that 2 of the 5 that make our Guide to Malaga best religious sights in Malaga are nearby. And don’t miss the Oratorio de Santa María Reina either. The inside is entirely decorated in brightly coloured frescos that, although they’re very recent and not at all historical, are lovely. This church is supposed to open on weekday mornings, but we’ve found it closed a couple of times. If you’re not lucky the first time it’s worth returning for. 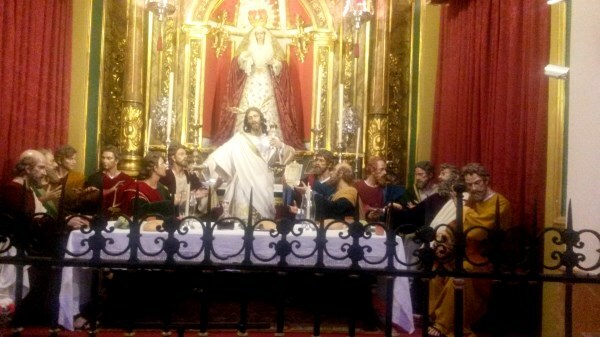 This church is Plazuela Virgen de las Penas – take the second left from Calle Andrés Pérez into Calle Arco de la Cabeza and see the church at the end of the street on your right. Façades – the buildings are among the oldest in Malaga so when you’re wandering around the streets take in the different styles and colours of the façades. Medieval walls – Malaga was once an entirely walled city (read our post about walking the walls in Malaga here), but today few stretches remain. 1 of the best preserved can be seen from Calle Carretería (in full restored glory) and from Calle Arco de la Cabeza (in less than restored glory). Look out for other signs of walls as you walk around. Vertical garden – this is 1 of our favourite places in Malaga. It’s right off the beaten track and can be difficult to find but it’s worth seeking out. 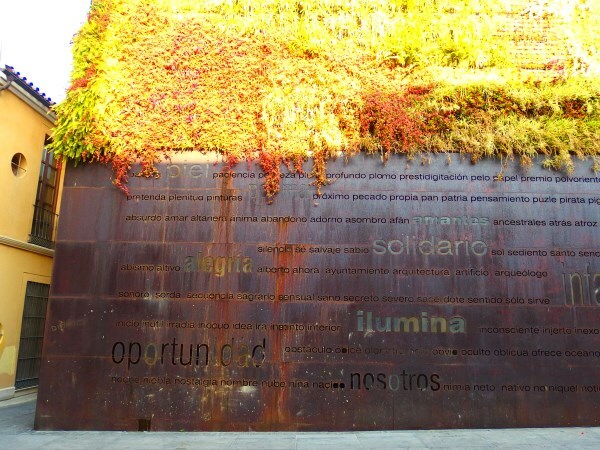 Below the verdant plants, poetic words have been carved into the metal façade. And best of all, there’s usually no one there! How to find the vertical garden – turn into Calle Pozos Dulces (left off Andrés Pérez) and take the first right. The plant-covered wall is round the first corner on your left. The best way to reach Calle Andrés Pérez from Malaga city centre is to take Calle Granada from Plaza de la Constitución and turn first left into Calle Santa Lucía. Follow this street until you reach Plaza de los Mártires and continue straight on into Andrés Pérez. Or get to this hidden corner of Malaga via Calle Carretería – second right after you enter Carretería from the river. Casa Mira – even if you don’t fancy an ice cream pop in here to feast your eyes on the interior design. Stunning! 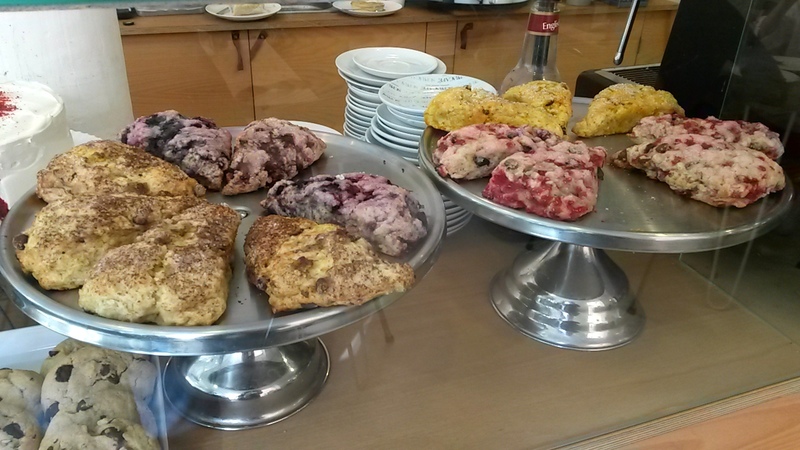 El Calafate – great veggie food and excellent value lunch menu. La Casa Invisible – shady patio so a great spot for those sultry summer days. Refreshments and lunch menu with very reasonable prices. Brunch-it – yummy pizzas and burgers plus some excellent breakfast deals. Organic too so it’s good for you as well as delicious. Julia Bakery – 1 of our favourite places for afternoon tea. Don’t miss the raspberry scones and sour-dough bread. Casa del Cardenal – antiques galore in a beautifully restored palace. Don’t miss the view of the patio through the railings. Mahatma – art gallery and workshop, and there’s always something interesting going on here. Scrappiel – a must for scrapbook and paper art fans, this is 1 of those craft shops that’s so difficult to find nowadays.